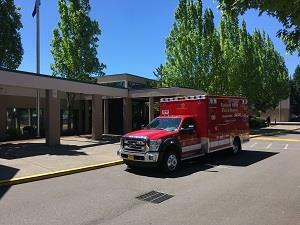 Shortly before 11 a.m. today, firefighter medics were dispatched to Tigard High School on reports that two students fainted and a third student felt lightheaded. As the three students were attending the same ceramics class and the symptoms occurred at roughly the same time, firefighters called for the TVF&R Hazardous Materials Team due to the possibility of exposure to harmful chemicals. The teacher and students evacuated the classroom, and school facilities staff closed off the HVAC system to the classroom to prevent any potential infiltration into other areas of the school. While paramedics treated the three patients, the Hazardous Materials Team investigated the classroom and HVAC system to determine if toxins or chemicals had caused the students' symptoms. The team concluded that there were no harmful substances in the area. Paramedics on scene assessed the students. One student was transported to an area hospital, a second student was released to a parent, and paramedics cleared the third. It is still unknown what caused the symptoms; however, they had been standing for a prolonged period of time. The HazMat crews deemed the classroom safe. As further precaution, the school district canceled ceramics classes for the remainder of the day. Notification about the incident was sent to all parents/guardians by the Tigard-Tualatin School District spokesperson while the incident was in progress.